We don’t like to think about it ahead of time, but choosing the perfect dog or cat pet urn during the last part of our animal’s journey can actually help start the healing process, especially when you work with a stellar artist like Alexandra Koiv of Custom Pet Urns.com. We recently had the pleasure of meeting Alex in person and were thrilled to learn that Tripawds Member Karma (Brendol and Addy‘s Mom) actually owns one of Alex’s masterpiece urns for her angel kitty, Allegra! In getting to know Alexandra, we learned that not only is she an awesome artist but she also provides a healing touch by working with clients in need of support during major life transitions like losing a best friend. She’s quite an interesting lady, we think you’ll agree when you check out this interview with her. Alex, how long have you been making pet urns? Why did you decide to start making them? I started making pet urns about 15 years ago. I was making functional art furniture at the time, when a friend asked me to make an urn for his cat, Steven (he had two cats, both named Steven. He figured since they both came to the name, they could share it.). It took me a few months to wrap my head around the idea, but once I did, I saw that there was a whole business out there for me that combines art, animals and helping people. When you make an urn for someone, what goes through your mind as you create it? I always try to stay focused on what the customer wants. It is a bit like mind reading, so that part can get challenging, but if I stay present to the conversations I have had with the pet’s owner, the pictures or stories I have of the pet, there is a flow that comes through the work, which always makes for the most successful urns. In what ways do your urns honor an animal’s life and spirit? Well, I always keep my focus on the pet, as if they are already in the urn, so I stay in a place of respect with the work. Because there is so much more involved thank just creating ‘a piece of art’, and the urn becomes the pet’s final home, I really try to create the urn that reflects the joy, beauty and love that comes from their relationship with their pet. Tell us about your tarot coaching? What made you decide to pursue these two interests of yours? My work with the urns came from being a visual artist and the desire to help people. With tarot coaching, I am continuing to help people, and stay in a visual/representative conversation at the same time. For me, it is a natural progression of the work I have been doing, keeping a focus on helping people, and staying in service to them. What can someone gain from your coaching? How can this be a life-changer for them? People always know what is best for them. I trust that. My role as a coach is to walk with them through that process and hold up a mirror to what is stopping them, where they need clarity, what their true desires are, etc. We are all capable of so much in this life but have so much stuff that gets in our way. To move past all that ‘stuff’ can really allow you to live the best possible life. When you really tap into yourself, what shows up is amazing. Allowing that to happen is incredibly powerful. Can this be a form of grief counseling for someone who just lost an animal companion? Absolutely. There is so much wrapped up in grief. “Did I do enough?” “Did I give my dog the best life possible?” “Was it really the right time to make the choice to let them go?” It can all make the pain of loss so very much harder. Getting perspective and having someone by your side as you process can really help with closure, guilt, ambiguity, and whatever else may show up. How are your sessions conducted? In person? Skype? Phone? Email? I do my Tarot Coaching mostly over the phone. At first I was a bit concerned that, since tarot is a visual medium, that it would diminish the process. I have found the opposite to be true. As I talk about the images that come up, the client actually gets to see what they need to see, created from their own imagination, which is very powerful. It’s the difference between reading a book and seeing a movie. The movie shows you everything, the book challenges you to create from your own imagination. Learn more about Alex’s work by visiting her at Custom Pet Urns and Vaike.com. And remember, our Tripawds Custom Pet Urn Tags can put a finishing touch on Alex’s one-of-a-kind original pet memorial urns. Awesome, thanks Karma. Yes I agree the urn is a lifetime keepsake. And thank you so much for giving me the honor of creating B’s tag, you are too kind. Awesome article. 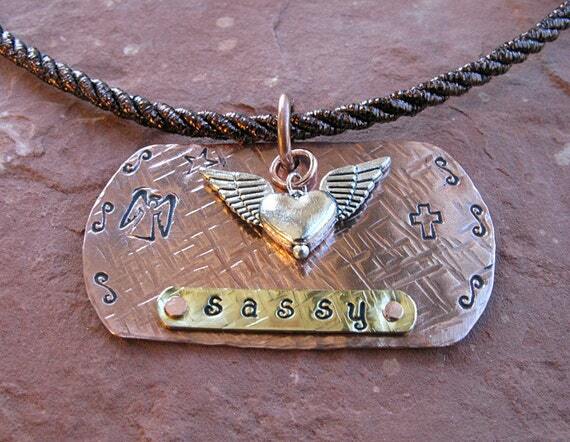 And I can vouch for Rene’s memorial tags she did Sassy’s and the one posted in the article is hers. Aww thanks Michelle, it was an honor to create it in Sassy’s honor. And yes, I LOVE Allegra’s urn.